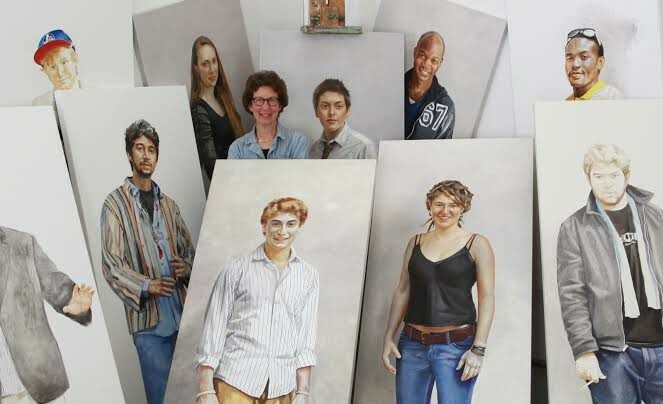 "Passing Through," Kate Gridley's traveling exhibit of life-size portraits of "emerging" adults, recently returned home to Middlebury after a year of touring museums and galleries throughout New England. Now hanging in the Jackson Gallery in Town Hall Theater through October, the paintings and their accompanying audio components capture 17 young people in the fluid stage of life in between adolescence and adulthood. Today, September 26, a series of events inspired by Gridley's exhibit will be held throughout Middlebury. In the morning, 40 professionals who work with emerging adults in the mental health and education fields gather for "Shhh ... Just Listen." The workshop is led by Michelle Kaczynski, a 25-year-old clinician who specializes in that demographic in her work with the Counseling Service of Addison County. At 12:30 p.m., Jeffrey Jension Arnett, the Clark University researcher who first coined the term "emerging adult," gives a public lecture in Middlebury College's Dana Auditorium. Arnett's widely cited 2002 article was the first to posit that young people in industrialized societies spend their "late teens through their mid-twenties in self-focused exploration as they try out different possibilities in love and work." Following Arnett's talk, from 2 to 5 p.m., Gridley leads free public tours of the gallery exhibit in the Jackson Gallery. At 5 p.m., she'll be joined by Middlebury College professor Dana Yeaton and his Playwriting I students, who give a reading of monologues developed using Gridley's portraits as a visual point of inspiration. Creating dialogue and interdisciplinary projects, Gridley says, has been one of her goals with "Passing Through" since the beginning; she realized early on in the painting process that "the kids had these great stories to tell." "I wanted the project to be used by educators — or people with ideas I hadn’t thought of myself — as a springboard for some kind of engagement with the population [of emerging adults] or people who work with people that age," she says. Initially, that resulted in the creation of "sound portraits," audio narratives by Gridley's subjects she tapped to help her record and edit. But as "Passing Through" made its yearlong tour beginning in August 2013, Gridley was looking for ways to use the exhibit to connect with the public — and to connect young adults to art. "I, myself, am very interested in conceptual art, but there are many people that are scared by it," Gridley says. "People come into a gallery and can’t access immediately what’s on the walls. I wanted my work to be easily accessible." Yeaton's student playwrights, as Gridley notes, are emerging adults themselves. Kaczynski is another example. She first saw "Passing Through" during its run at the Amy E. Tarrant Gallery in Burlington while completing a master's on emerging adulthood at Saint Michael's College. "[Kate] was basically capturing all the themes I’d done in my thesis in an out-in-the-open artistic and creative format," says Kaczynski, who then reached out to Gridley. Before long, the wheels were set in motion for what would become Friday's "Shh ... Just Listen" workshop. While the term "emerging adults" — aka Millennials — may be a fixture in the lexicon at this point, it's still an unusual demographic to find rendered in oil. Historically, the subjects of portraiture have been affluent or politically significant, generally older individuals. Gridley herself is a well-known artist whose portfolio includes the official portrait of former Vermont governor Jim Douglas, which hangs in the Vermont Statehouse, and one of Judge William K. Sessions III that hangs in the Thurgood Marshall Federal Judiciary Building in Washington, D.C. Though Gridley put the same amount of care, time and technique into her "Passing Through" portraits, they're a far cry from the more formal examples of the genre. Her young subjects slouch, grin or seem to nod towards viewers. The subjects have diverse stories, and appearances, but each has a personal connection to Gridley and to Middlebury: They are exchange students, college students, family friends and the painter's own sons. "Many of the young people have literally 'passed through' my house, in one way or another," Gridley notes. The seed for "Passing Through," she remembers, was planted during a visit to the Frick Museum in New York City; she became captivated by a richly detailed oil portrait of an affluent, married young man in his twenties. "I remember being struck by the fact that my own son was that age," Gridley says. "I remember thinking, My God, it’s so different now." Then, in 2008, she and her husband went to Ohio to work for Barack Obama's presidential election campaign and found themselves surrounded by fellow volunteers in their late teens and early twenties. "All of our field bosses were 21 and 22," Gridley recalls. "We were so inspired by all these young people being active and being committed to work — loudly — for something they believed in. It was so comforting, so hopeful, because the world is a mess. And your generation, I think, is really special and really powerful."